I am excited to report that I can check off the first item from my 30 by 30 list. Officially, I accomplished the task prior to writing the entry, but it’s been on the list for a while. 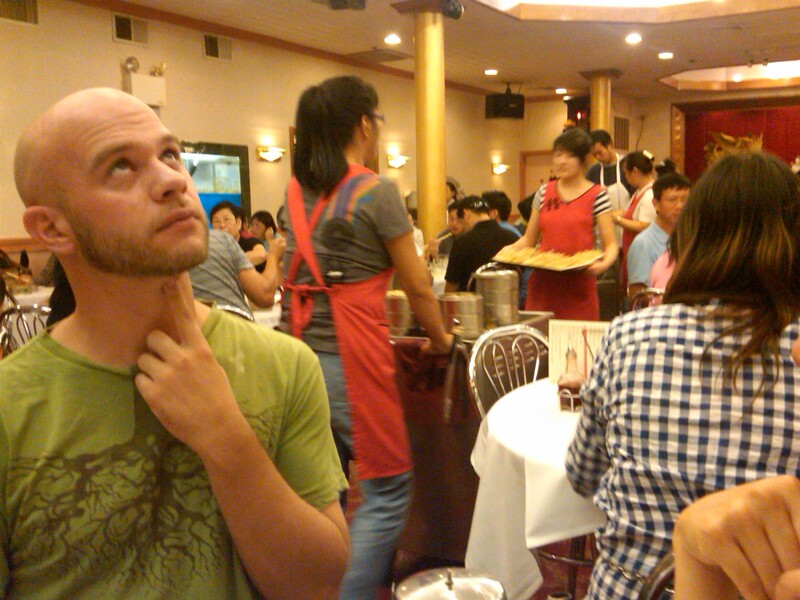 Ever since that experience, I’ve wanted to have a dim sum experience with someone who is familiar with the language, culture and food. My friend, Teresa, fits that bill on all accounts, so we set a date with our respective significant others. We planned on hitting Chinatown at 10am when the restaurants were just opening, but ended up getting there a little closer to 10:15 due to traffic and parking. Apparently parking is a hot commodity in Chinatown on a Sunday morning. We walked into Ocean Harbor a few minutes after 10am and the place was already packed. Teresa immediately took control and got a number from the ever popular maitre d’/host/gatekeeper. The number was scrawled onto a piece of paper while the gatekeeper held a clipboard with an elaborate seating system that only he could decipher. We waited close to 45 minutes before we were seated at a four-top with a great view of the food offerings coming from the kitchen. 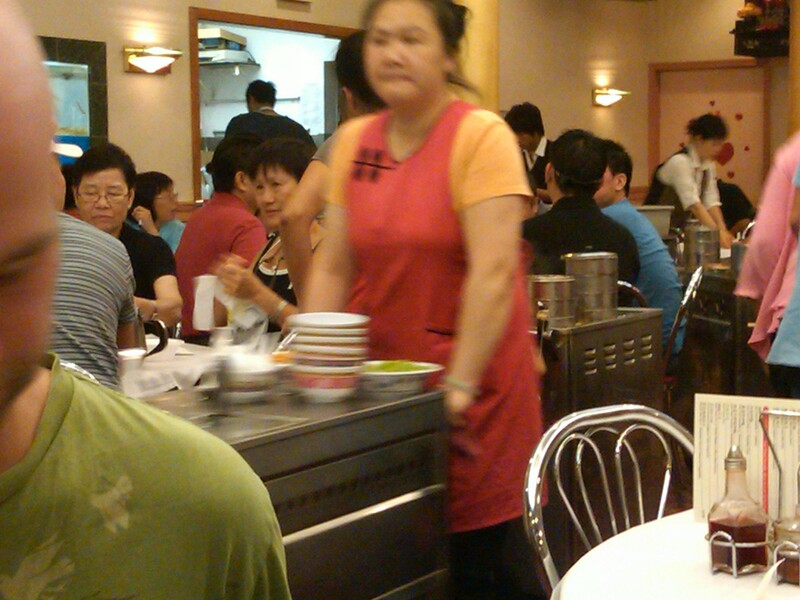 Prior to selecting any dishes, Teresa picked up the tea menu and ordered a chrysanthemum tea. I don’t remember where I read it, but I read somewhere that if you order tea at a Chinese restaurant, they take you more seriously. Who knows. The tea was pretty neat looking. Those crystals next to it are sugar that you put right into the teapot brimming with Chrysanthemum buds. Although I’m not much of a tea connoisseur, I could taste (and smell!) 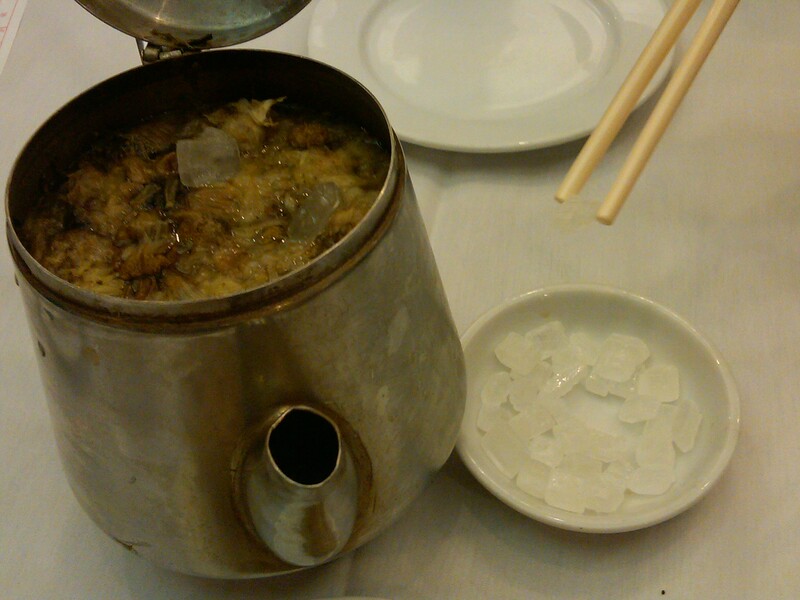 the floral aura of the chrysanthemum, and the sweetness increased as we got closer to the bottom of the teapot. 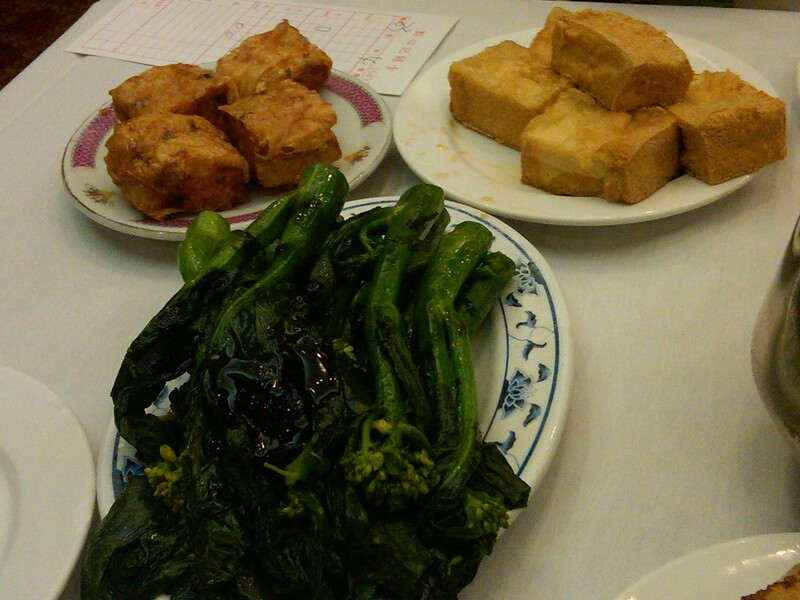 We immediately grabbed chinese greens and fried bean curd along with a special of pork (?) wrapped in bean curd and fried. I will apologize in advance that some of my memory and/or spelling and/or interpretation of what the heck I was eating may be incorrect or lacking. Greens always make me happy at Dim Sum restuarants. Why? Because it’s something that I actually can recognize and know exactly what I’m eating. The only problem is those little buggers are awful tricky on the chopsticks. The greens were nice and al dente with a sweet and salty sauce that I could have drank in a cup. I passed on the fried bean curd but we all agreed that the other, special, dish was phenomenal. Next, we grabbed my all-time favorite, turnip cakes!!! How could the Chinese possibly make something simple taste SO good? 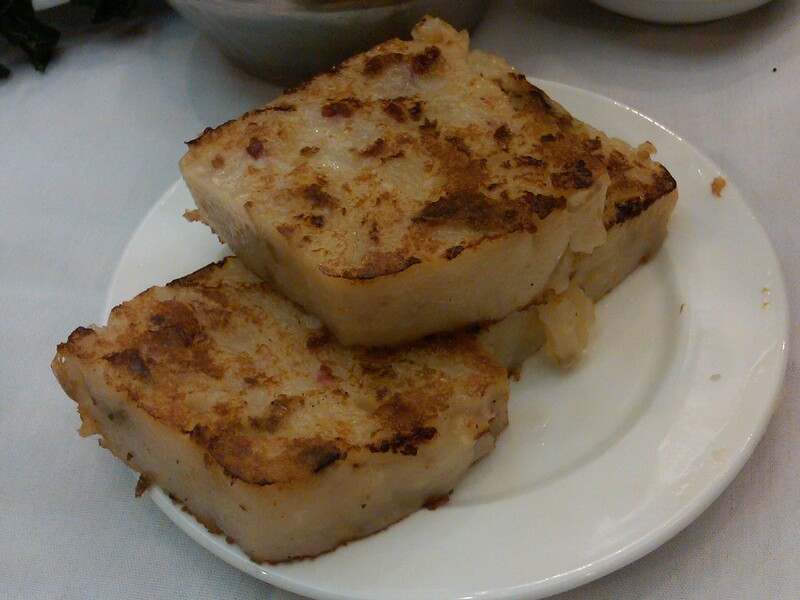 I have no clue, but I could eat turnip cakes all day long. Seriously. Things start to get a little fuzzy from there. We just started pointing and ordering and Teresa spoke a mix of Chinese and English with the ladies wheeling the carts around. Or maybe she was just speaking English. It was really loud and hard to hear, which is why I left most of the ordering to her. That’s my friend Brian when I told him to act like I was taking a picture of him so I could sneak a picture of the restaurant. Of course I accidentally took a picture of him while doing so. Very Rodin. The next few dishes came so quickly that I got a little lax with the pictures. I didn’t want to miss anything! Brian had been dying for the sticky rice in a banana leaf, which, after some googling, I learned is called “zongzi.” It was stuffed with an array of some identifiable and some unidentifiable meat. 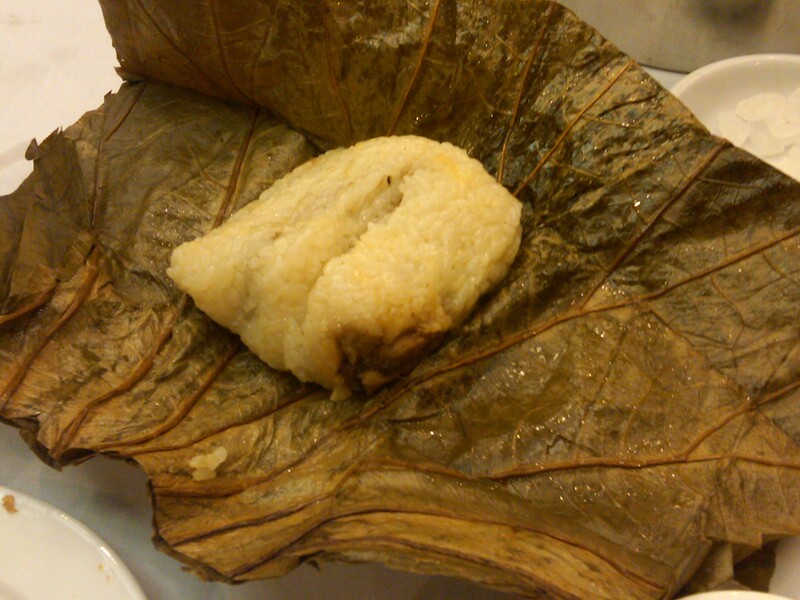 I enjoyed the sticky rice, but two big packets of zongzi became slightly overwhelming. 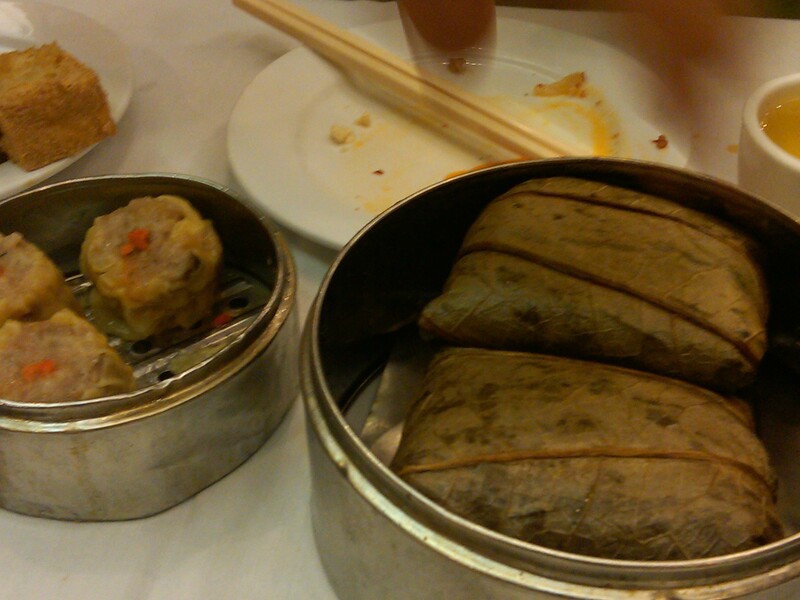 Next to the zongzi are pork shumai that we all devoured. Although I tend not to be a pork eater, that was probably my favorite dish of the afternoon (besides the aforementioned turnip cakes.) 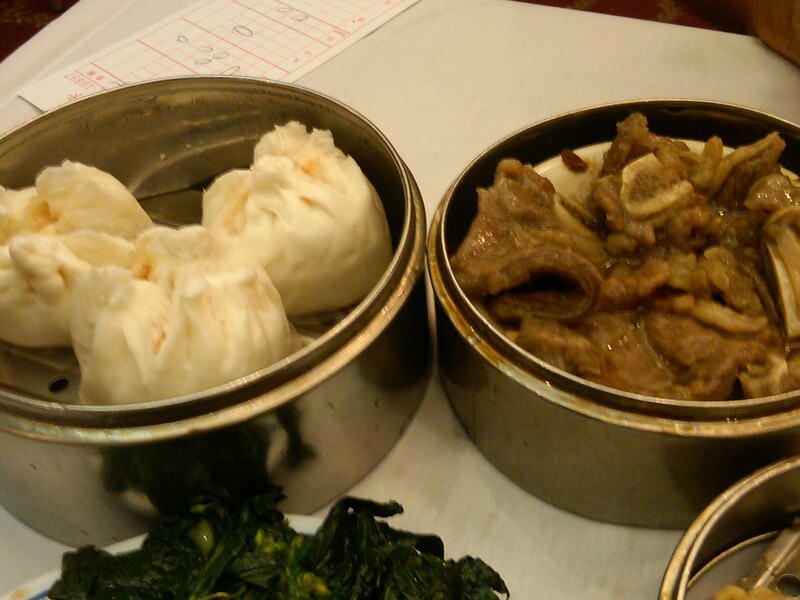 We also went with the traditional pork bun, which benefitted greatly from a touch of chili oil and soy sauce. Next to the pork buns are Teresa’s favorite, ribs. I didn’t have any ribs, but the rest of the table sang their praises. Look at how many plates we have stacked up! 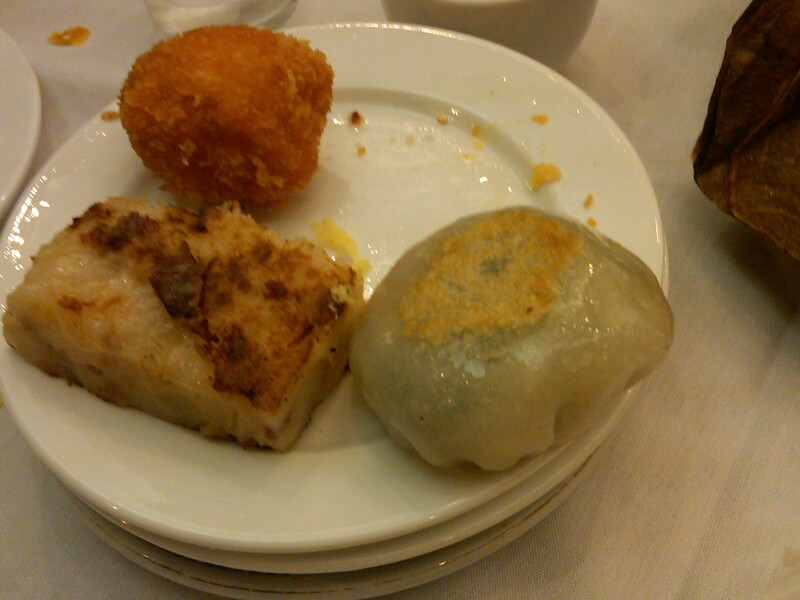 On the right was a scallion dumpling which popped with fresh, green flavor. On the upper left was a fried shrimp ball which was fine, but did not have much flavor on its own. I’m trying to figure out what the bottom left item is and I’m going to go with another picture of the turnip cake? Who knows. 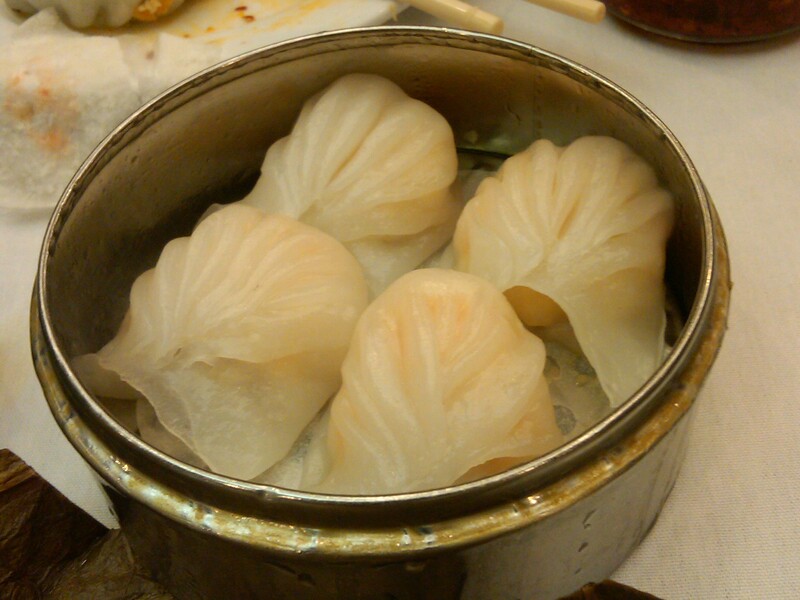 One of our last orders was shrimp shumai which was a simple but clean finish to the meal. We may have had dishes that I missed. I can think of one flaky, sesame pastry stuffed with pork and/or red bean paste that didn’t quite wow us. There may have been another dish or two that I was unable to capture. Overall, it was a phenomenal meal made even better by the fact that it was only $40 for the four of us! What an amazing bargain!